Warner Brothers were on Phil Spector's back after giving him a huge advance and seeing no product in return. So this collaboration with Leonard Cohen seemed an unlikely one, given Spector's predeliction for using big-voiced singers, but Spector apparently held Cohen captive at an evening he'd organised after they'd earlier met at a Zen retreat. Both drank late into the night and all the songs were written in the space of two weeks. 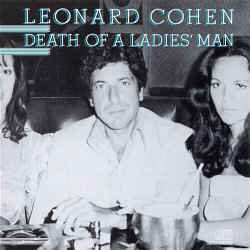 Generally speaking, Cohen can spend as long as two years on a set of lyrics alone, so that was highly unusual for him. Warner Brothers didn't promote the album, and eventually Columbia Records released it in Europe where Cohen had a much larger fanbase. With over thirty musicians employed, Cohen's vocals here are hidden by Spector's trademark 'Wall of Sound'. It's not quite as simple as that however, as the vocals Spector used were largely guide vocals only, for what Cohen saw as works-in-progress. So Spector ended up producing, recording, and mixing the album with Cohen locked out of the studio. Cohen complained that he'd been held at gunpoint by Spector during the recording sessions, and later wished the album had never seen the light of day. I'm a fan of both Spector and Cohen. So considering the lyrics were put together in just two weeks, Cohen does a fine job in places, even if the quality of his writing is far from that displayed on previous releases. And Spector used his regular musicians, those who had worked with him since the 1960's, but whilst they're all quality musicians they're ultimately let down by the mix - this is a very muddy-sounding record, even by Spector standards. A couple of mis-steps seem inevitable with such a strange coupling as Spector and Cohen, and "Fingerprints" is one of them. I assume this corny, comedic vehicle complete with Country fiddle is not meant to be taken seriously, the production making it sound like it was recorded in a basement in the 1950's, some feat even if unintended. "Don't Go Home With Your Hard-On" could also be said to be amusing, depending on your sense of humour - I find the lyrics rather blunt and lacking the subltey of Cohen's better work. I enjoy the first two songs though - both seem connected to Cohen's previous work, and although they feature many Spector trademarks (the heavy echo during "Iodine" for instance), the quality of the compositions shines through. "Memories" is a personal favourite of Cohen's, and the only song here he would revist during live performances. It seems to come from a very Spector-ish place though, nostalgia for the 50's - with a better-recorded Cohen vocal it could've been superb. Some Cohen fans will baulk at the Spector 'Las Vegas musical' style, complete with backing singers, but I love the saxes, the swinging rhythm and Cohen's own imperfect yet impassioned vocals. ... Spector hadn't moved forwards in time, wishing the 1950's and 1960's had never ended. And Cohen seemed divorced both emotionally and physically from his own album.